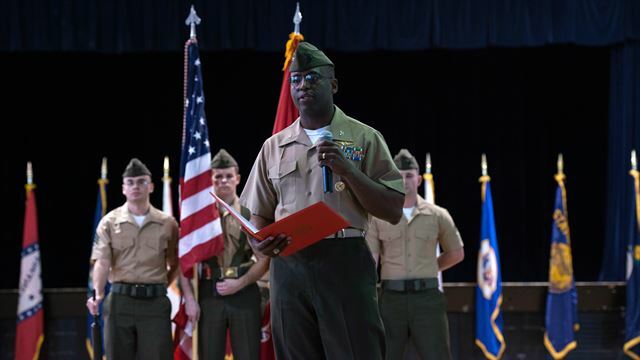 Col. Ossen J. D’Haiti, the commanding officer of MCCYWG, speaks to the audience during the activation of command ceremony of Marine Corps Cyberspace Warfare Group at Fort George G. Meade, Maryland, March 25, 2016. The mission of MCCYWG is to man, train and equip Marine cyberspace mission teams to perform both defensive and offensive cyber operations in support of United States Cyber Command and Marine Forces Cyberspace Command. (by Matthew M. Burke, Stars and Stripes) – The Marine Corps is standing up a new unit of cyberwarriors as the global battlefield evolves to include more and more computer networks. 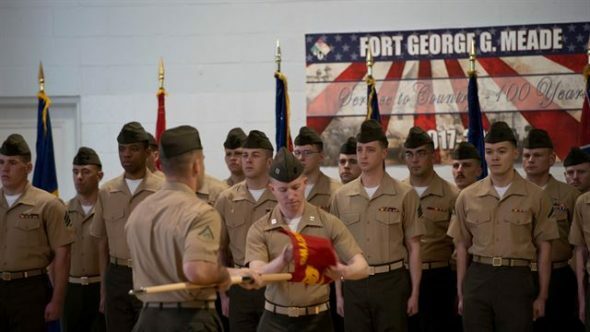 The Marine Corps Cyberspace Warfare Group (MCCYWG) was activated Friday in a ceremony at Fort George G. Meade, Md., a Marine Corps statement said. Its mission is to man, train and equip Marine cyberspace mission teams to perform both defensive and offensive operations in support of U.S. Cyber Command and Marine Forces Cyberspace Command. Marines with Marine Corps Cyberspace Warfare Group prepare to post the guidon during an activation of command ceremony at Fort George G. Meade, Maryland, March 25, 2016. The unit has “a few” cyber teams up and running, the statement said; however, it won’t be fully operational until sometime next year. Everything from power grids, banking, government operations to defense contractor weapons’ plans have shifted online in the past few decades. That information is a tempting target for both state-sponsored hackers and criminal organizations that are becoming increasingly sophisticated at cybertheft. During a town hall meeting with Okinawa Marines in November, Marine Corps Commandant Gen. Robert Neller [said] that China had stolen military secrets from the United States. The Navy, Army, Air Force and Coast Guard are also actively recruiting cyber soldiers and standing up their own cyber units and programs. Reprinted here for educational purposes only. May not be reproduced on other websites without permission from Stars and Stripes. For the original article, visit stripes .com. 2. What is the mission of the newly created Marine Corps Cyberspace Warfare Group (MCCWG)? 3. When will the MCCYWG be fully operational? 4. The U.S. Military has always had the means to protect their communications. Why has it now become vulnerable to theft? 5. What types of information are targets for hackers? 6. a) What did Marine Corps Commandant Gen. Robert Neller say about our adversaries during a townhall meeting with Okinawa Marines? b) What do you think the U.S. government should do about this? Ask a parent the same question. 7. The Navy, Army, Air Force and Coast Guard are also actively recruiting cyber soldiers and standing up their own cyber units and programs. Do you think this would be a good career? Explain your answer.